At the airport in Oklahoma City, I munched on a third Major Milk Makin’ Lactation cookie while contemplating the news of an unexpected 29 hour layover in Amsterdam. “That is a long layover,” I thought. Actually, I was a little angry at the time, so I believe my thoughts may have had some more descriptive words that connoted my irritation. Apparently something had gone horribly, horribly wrong. I had been so excited about the future just an hour beforehand, gushing about the beauty of life like a simpleton. But now the beginning to my spring semester was darkened, and the shininess of the attending Delta employee’s bald head did nothing to ease my dread, and the fact he implied that this predicament was my fault only served to incense me. “Who made the reservation?” he said. “Does it matter?” I half snapped, half asked politely. A Muppet friend could have made the reservation, but that didn’t alter the fact that Delta had confirmed it and then changed the flight without notifying me. Someone was going to pay for this. As it turns out, Delta/KLM agreed with me. In Atlanta, I learned that my flight from Amsterdam was no longer scheduled for Jan. 24th at 5:25 pm, but for Jan. 25th at 5:25, and that since it was not my fault, I would be taken care of in Amsterdam by nice people who would put me in a hotel and feed me. At the airport in Amsterdam, I talked to some truly wonderful KLM representatives, one of which had a voice like the Swedish chef, and eventually wound up in a hotel nicer than one I would ever be able to afford (as an Arabic fellow making $520/mo.) and confronted with a lunch buffet of my wildest imaginings. Bread! Butter! Prosciutto! Little things of jam I could steal! Oh happy day! I even got a toiletry bag from KLM filled with, among other things, spray on deodorant with man-smell (the cooling sensation on the pits is quite nice), and a European size XXL white t-shirt, which translates to an American medium. This was perfect, since I didn’t have pajamas in my carry-on. 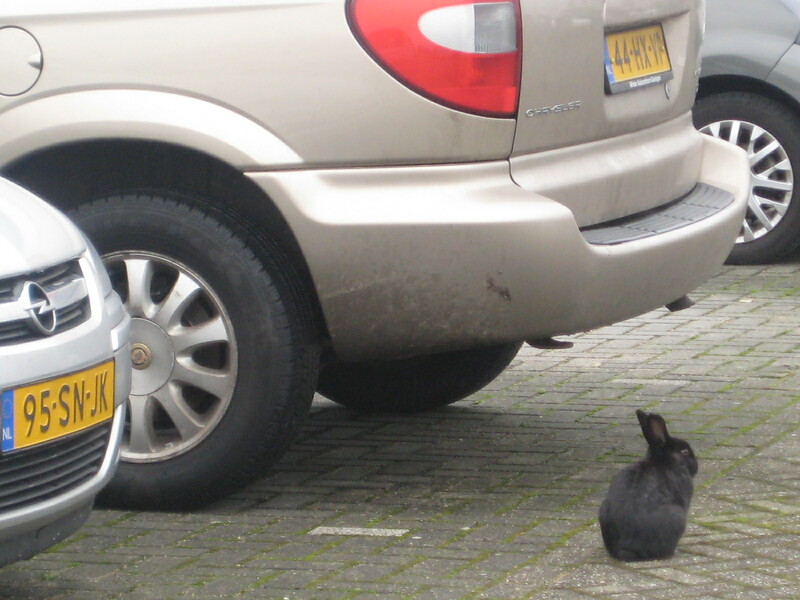 Later that day, I chased and took pictures of bunnies in the hotel parking lot, went to Amsterdam, and ate a 3 course meal by myself while reading A Confederacy of Dunces and watching happy dinner parties in a lovely dining room lit by hundreds of votive candles and decorated with roses. It has been a most wonderful paid vacation. A word on Amsterdam: at one moment I thought to myself, “If you’ve never considered suicide, try going to Amsterdam in the winter. There are many lovely bridges to contemplate jumping off of after tying a stone to your foot.” I had been to that city once before, in the summer, when it was sunny. I now realize that it may have been the one sunny day they’d had all year. While wandering around Amsterdam, I felt like I was in the surreal, dark world of one of the characters from a Rembrandt painting, surrounded by people who were hurrying to get home to the light and remember a reason for living. But that’s just my impression. The windows of the city are quite lovely though. Hopefully I will arrive to Cairo for real-sies today. One time an airline lost our luggage and we got the little toiletry kit with the t-shirts too. Love those things. It was totally worth it. I was hoping for a shirt with the KLM logo on it, but it was just a big white one that was, however, exceptionally soft. Ha ha! Bunnies in parking lot? 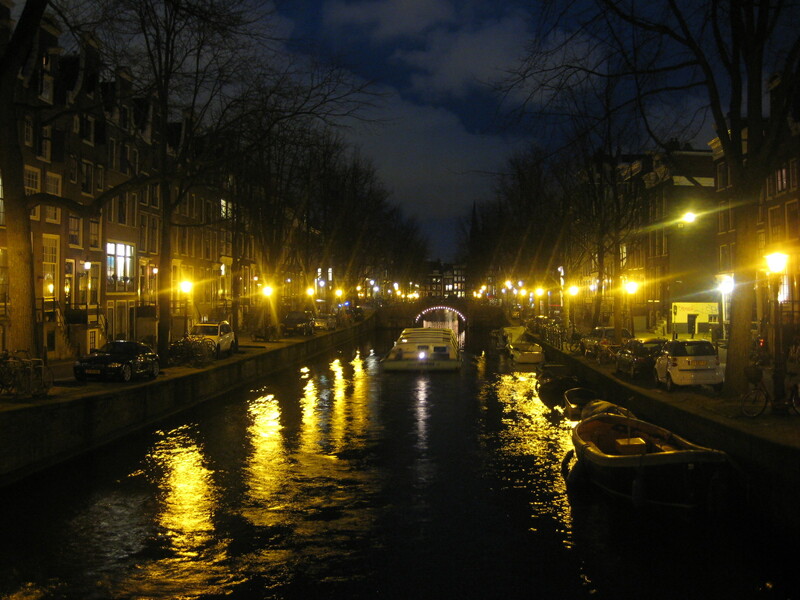 And Amsterdam sounds a lot like Seattle, where you had to take a number to jump off the bridge. Maybe there’s a reason they included the word “dam” in the name. as in: “Amster-dammit I’m still here and it’s winter. Where have all the tulips gone…there’s no reason to live!!!! !” Or something like that. That doesn’t sound like a bad deal at all, as long as being a day behind doesn’t screw you up. And why not visit the hashish district before committing suicide? Thank goodness all of Amsterdam is the hashish district…without the herb who knows how bad body traffic would be in the canals? The only good thing about an airline messing up your flight schedule are the freebies that follow. I once also got to stay in a fine hotel, in Seattle, with chocolates on the folded down bed covers – a double bed room usually reserved for pilots 😀 and a free continental flight, to boot. Well done! Whenever I become rich and possibly famous, I think I’ll have an award I give out to the people who milk their airlines for all their worth. The people making out with the highest cost of swag win. I took a bunch of chocolate covered cookies from my flight too. I never regret taking too many freebies.